Recently the “20 Things A Father Should Tell His Daughter” post from a few months ago went completely (and unexpectedly) viral, and some pretty rewarding things happened as a result. Just this once I’m going to break my blogging-about-blogging rule and share a little about the experience. There’s a really cool family-related story at the end, so I hope you’ll stick with it. I’ve always wondered what it would be like to create something that went viral (shout-out to my buddy Ron Fugelseth, who’s “A Toy Train In Space” set the standard for dorky-dad virality) – not out of some self-centered egomaniacal trip, but because the mechanics of virality (is that even a word?) fascinate me. If I was a sociology or media-studies grad student I would make that the topic of my thesis (tip-o-the-hat to fellow dadbloggers Ande Davis and Zach Rosenberg who have strong feelings about the value of a liberal arts degree). 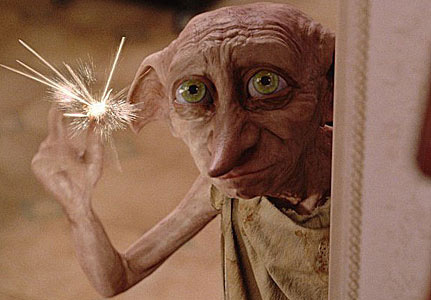 How could I forget Dobby? …until I realized what an epic fail it was because I neglected to include this culturally-critical elf. Virality-factor: zero. 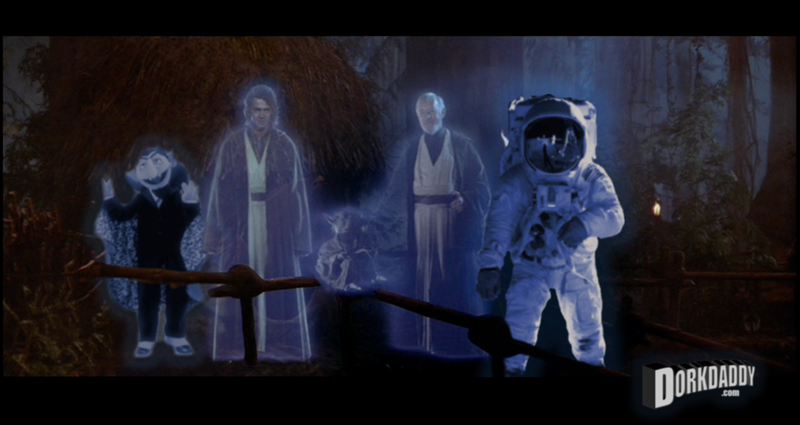 When Muppeteer Jerry Nelson (Count Von Count) and Neil Armstrong died in the same week, I pushed my graphics skills to the max and put this one out there in cyber-space. Perhaps the Jerry Nelson reference was too obscure. 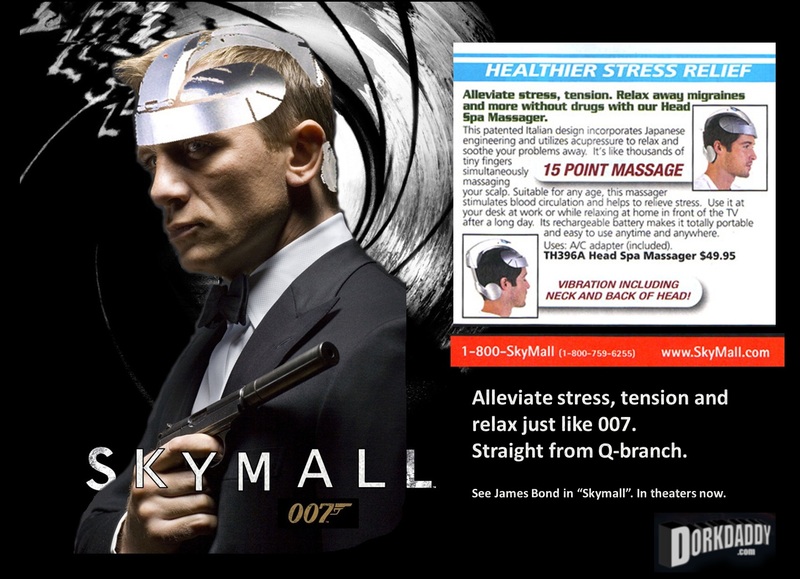 Again, virality-factor zero. Before this week the range on my hit-counter graph never needed to go above 3000 before. On Monday, a day when I published absolutely no new material, DorkDaddy.com topped out at over 6,700 hits – completely blowing its previous record out of the water. 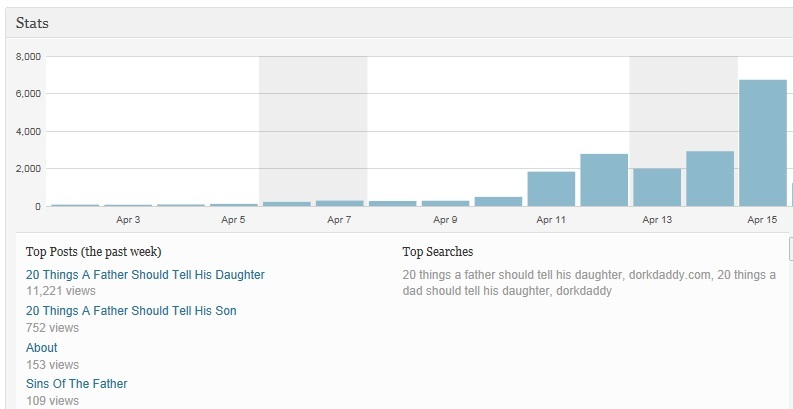 As the graph shows, most of the hits were happening on “20 Things A Father Should Tell His Daughter”. To be honest, I knew that post had legs shortly after I published it. Within days it had been shared more than 200 times from this blog’s Facebook page. 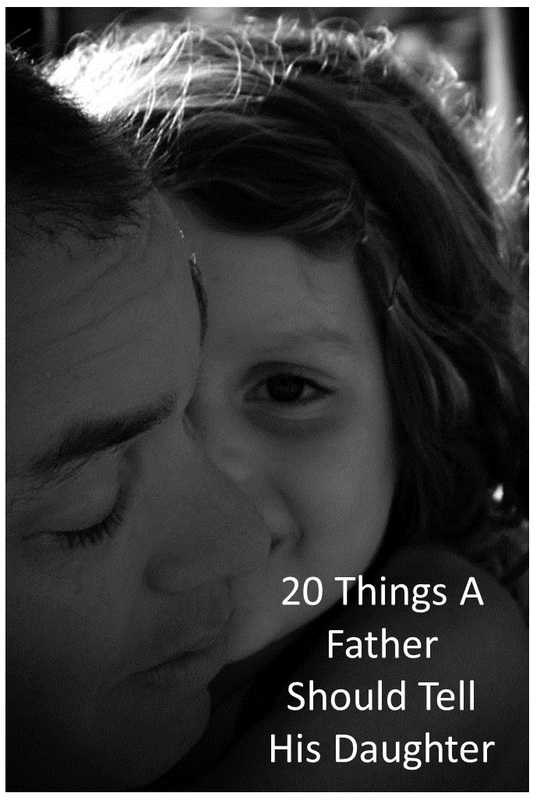 I was getting notifications that it was moving all over Pinterest and it got all sorts of attention when I published it on Good Men Project along with the companion piece “20 Things A Father Should Tell His Son”. The post had gone completely beyond my sphere of influence and was now freely circulating, completely organically, through the Facebook ether. Even as I write this I just fielded a phone call from my wife. A girlfriend texted to tell her that an old college friend just posted the picture on her Facebook wall, and my wife’s girlfriend recognized me and my daughter in it. Now the fact that something I made went viral is nice and all, but here’s the cool story where it all comes home. Part of the miracle of Facebook is connecting with distant friends and relatives who in the past would have been completely lost to the fog of time and distance spent apart. My mother’s recently been very excited about reconnecting with some distant cousins of hers. It’s opened up a floodgate to wonderful childhood memories and emotional connections to long-passed loved-ones, memories that were heretofore packed away and almost forgotten. My mother looked forward to seeing news from her long-lost distant cousins show up on her laptop when she opened up Facebook. “A friend posted it” the cousin replied. “Do you know who that is in that picture?” asked my mother. In what universe does your 2nd cousin once removed, someone you’ve never met or even heard of before, contact you over the internet because of a picture you posted of you and your daughter more than 4 months earlier? It’s a brave new world. Welcome to the age of social media.